Despite tremendous achievements in the fields of Artificial Intelligence (AI) and Machine Learning (ML), there remain several areas in healthcare and drug discovery where AI/ML has seen limited success. This includes, notably, improving the high attrition rates associated with discovery of new drugs. As genomic data becomes more widely available and clinical data continue to become digitized, there is an opportunity to use this data to understand and predict drug activity at a more personalized level than ever before. So what limits the application of AI/ML in the precision medicine & drug discovery space? 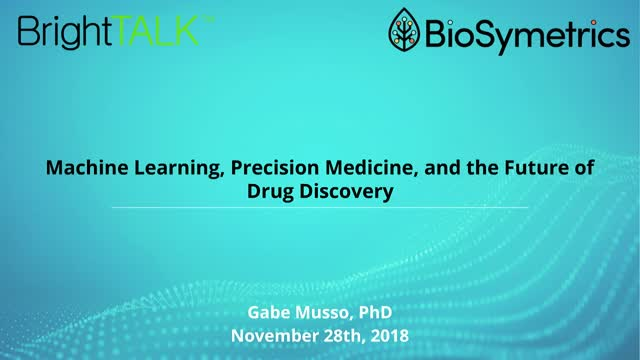 Here we discuss the practical advantages and limitations of AI/ML as it relates to precision medicine and drug discovery, focusing on challenges that need to be addressed before the promise of AI-based approaches can be realized. Healthcare today has serious issues with accuracy, safety, cost, patient satisfaction, and provider satisfaction. True semantic interoperability provided by standards based services has the potential to dramatically improve all of these aspects of healthcare. The improvement will be made possible not only by advances in standards and technology, but will also need to be driven and guided by expert front line clinicians. This session will describe the essential steps we must take to realize an optimal future healthcare system. Despite the billions of dollars of investment and the rapid adoption of digital healthcare, the financial forces driving payment, claims, financing and revenue cycle have remained virtually unchanged for years, impacting care delivery, population health, and driving the unresolved political debate. By comparison, the traditional industries of financial services and insurance are rapidly evolving and beginning to fundamentally change how transactions are conducted, to include platforms, access, monetization, and exchanges. Many of these technologies driving financial evolution in London, New York, Singapore and other centers of industry can directly apply to how healthcare can be "bought and sold," potentially democratizing healthcare transactions and changing revenue models, increasing care access and affordability. This webinar will review most significative challenges Nuclear Medicine physicians find in early diagnosis of neurological diseases using Positron Emission Tomography. Imaging quantification offers the possibility to identify subtle features unnoticed for the human eye. Qubiotech's first product, IQBrain, offers to Nuclear Medicine physicians help to diagnostic neurological diseases as Alzheimer, epilepsy, dementia and others by merging PET and RM images and quantifying hemispheric differences in brain function. Quantitative information is given as statistical significative differences between patient brain metabolism and a data base of healthy individuals. Furthermore, PET and RMI images are merged into a single multimodal image the physician can interact with.  Regulations: What are the most often cited violations? Are pharma marketers getting better at compliance? Cautionary tales – beware of agencies with limited regulatory experience.  Transparency: Do you have a transparency policy? Is transparency good in theory, but not in practice?  Patient Power: How are patients affecting pharmaceutical marketing? Mining the views of patients via social media to guide you marketing efforts.  Digital: How digital media and mobile are disrupting pharma marketing and what to do about it. What digital marketing channels are preferred by physicians? This BrightTALK Channel features useful content for pharma and healthcare professionals. Presentations will cover challenges and opportunities in the pharma and healthcare industries, ways in which to improve the pharma lifecycle management and build sound pharmaceutical marketing strategies.